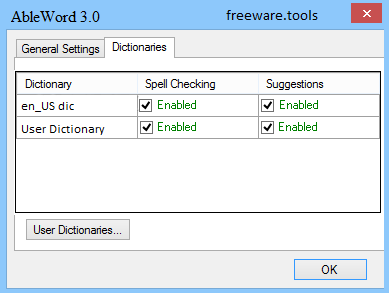 AbleWord is a simple yet efficient freeware PDF editor for Windows that allows users to edit PDF documents easily. This software gives you the ease of being able to edit PDF files and documents no matter where and when they were created. It is fully featured, supporting image formatting, tables, headers & footers and includes spell checking and print preview functions. With AbleWord you can add and edit text in a PDF file (correct spell errors), insert images, adjust layout, change fonts and colors, as well as edit pictures on the PDF file by simply right clicking on it. AbleWord aims to provide both beginner and advanced users with a simple, yet useful text processing application that features enhanced editing capabilities and extended input format support. It can help you create professional-looking documents, with embedded images, tables and text frames. One of its most important advantages is the range of formats that you can export your document in. Aside from the compatibility with popular file types such as DOC, DOCX, RTF and TXT, AbleWord can save your text in PDF or HTML format. PDF documents can be opened regardless of the used operating system and include rich representations of a document, comprising text, fonts and graphics, while HTML files can be used for adding a document content to your website. The GUI resembles that of any text editor, offering fast and comfortable access to formatting options, page setup and document preview. Moreover, the application comes with all the features that you would expect from such a utility, including the basic editing tools, page numbering, spell checking, word count, formatting options for fonts, text styles, paragraphs, headers and footers. Furthermore, it can help you easily create and edit the content of a table, with as many rows and columns as you need. Users can set the page layout, resize the header and footer sections and add borders to their document to make it more interesting. Detailed statistical information about your text is also available, since AbleWord can count the number of words, pages, characters, paragraphs and lines. To sum up, AbleWord is an intuitive text editor that can also act as a conversion tool between Word and PDF files. Although it does not offer the rich palette of features that Microsoft Office does, it is a reliable alternative, worth having around for editing documents in various formats.